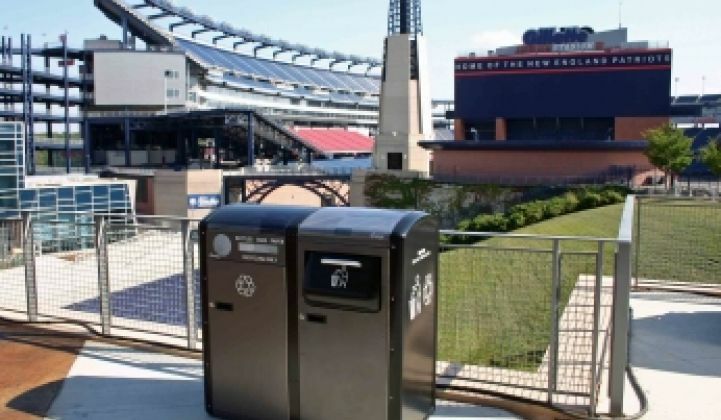 The Massachusetts company just raised $3.2 million to expand its business of developing wirelessly enabled, solar-powered trash bins for cities, parks, zoos and schools. It's a 300-pound solar-powered garbage gobbler that comes with a motor for compressing trash, a sensor and LED lights to gauge its fullness and a wireless device to send that information via text messaging to a server for notifying haulers. Yes, collecting trash has gone high tech with BigBelly Solar's trash bins, which the company markets mostly to cities, universities and state and national parks. You can find them around Fenway Park in Boston and the library of Trinity College in Dublin, Ireland. The Needham, Mass.-based company just raised $3.2 million to expand its business, said Richard Kennelly, BigBelly's vice president. Founded in 2003, the 22-employee company raised the sum from individuals and corporate investors, said Kennelly, who declined to disclose the names. BigBelly previously raised $1.1 million from investors including Massachusetts Green Energy Fund (BigBelly was formerly called Seahorse Power). The company has deployed about 2,500 of its trash compactors in the world, Kennelly said. Hundreds of them are in California, in places such as Stanford University, UC Santa Cruz, Cisco Systems in San Jose and cities of Hayward and Sacramento. Most of them have bought 10 to 20 units. "The bottom line is every city is currently spending millions of dollars every year on trash collecting and recycling. It's an expensive task that's not optional," Kennelly said. "Cities are looking to trim spending, but it's a public health issue." The company's biggest customer, the city of Philadelphia, is installing 500 of the BigBelly bins at its downtown this year to replace 700 ordinary trash cans. The ability of each 32-gallon receptacle to compact trash would reduce the number of collections from 17 times per week to five per week, Kennelly said. Without using the BigBelly bins, Philadelphia would typically spend $2.3 million per year to collect trash from the 700 regular bins. With the BigBelly bins, it would spend about $720,000 instead, Kennelly said. The city is buying the bins through a three-year leasing contract, paying $725,000 per year, Kennelly said. The compactors should last 10 years, so Philadelphia would save nearly $13 million during that time (including the equipment costs), he added. The city also is getting recycling bins and a service plan as part of the contract. The recycling bins aren't compactors. Each BigBelly compactor retails at $4,000, not exactly cheap. To reap major savings, cities would have to buy them in bulk instead of putting a few here and there. There is maintenance cost to keep these machines running well. Kennelly said the company already has lowered the price several times over the years. A lot of development work went into designing the solar power system into a compactor, which also is branded BigBelly, Kennelly said (see technical specs). On top of each bin is a 30-watt silicon solar panel that is protected by a polycarbonate shield. 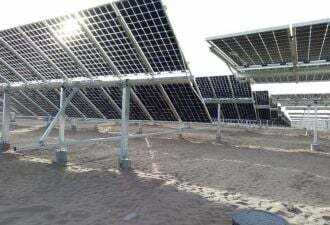 The company buys the solar panels from suppliers such as BP Solar and Kyocera, he said. The solar power charges a 12-volt battery so that the trash bin can work at night as well. The wireless feature is optional. If included, information about how full each bin is goes to a server managed by BigBelly. Philadelphia's bins do go wireless. "Customers can log in and see their machines in real time to optimize their collection and route planning," Kennelly said. "You don't want to send your trucks to pick up air, but full cans. You try to get that perfect balance."